One of the biggest benefits of modern marketing is that hotels of all sizes have many more opportunities for showcasing their unique features and capabilities. There are a plethora of digital marketing tools available – many of which are free or extremely affordable – making it easier for hotels to build a powerful and impactful presence while marketing their services in a highly effective manner. While it’s easier to create and execute marketing initiatives, that doesn’t mean the bar for polished materials has changed. If anything, event organizers and planners are becoming even more savvy, with higher expectations when they shop hotels for meetings and events. Having less than professional sales or marketing collateral leads to a lackluster first impression which can quickly become a turn-off to future business. To look impressive to potential clients and increase sales in the process, here are the 5 must-have hotel marketing tools. Hotels have long known that providing floorplans with different room set-ups ad layouts as well as specific placement for tables, chairs, and even extras like buffet tables or entertainment help planners and organizers visualize their specific meeting or event. Thanks to technology, 2D floorplan diagrams alone no longer provide enough detail or visualization. Organizers and planners expect a wide range of options for floorplan viewing, as is available with AllSeated’s 3D floorplan tools. 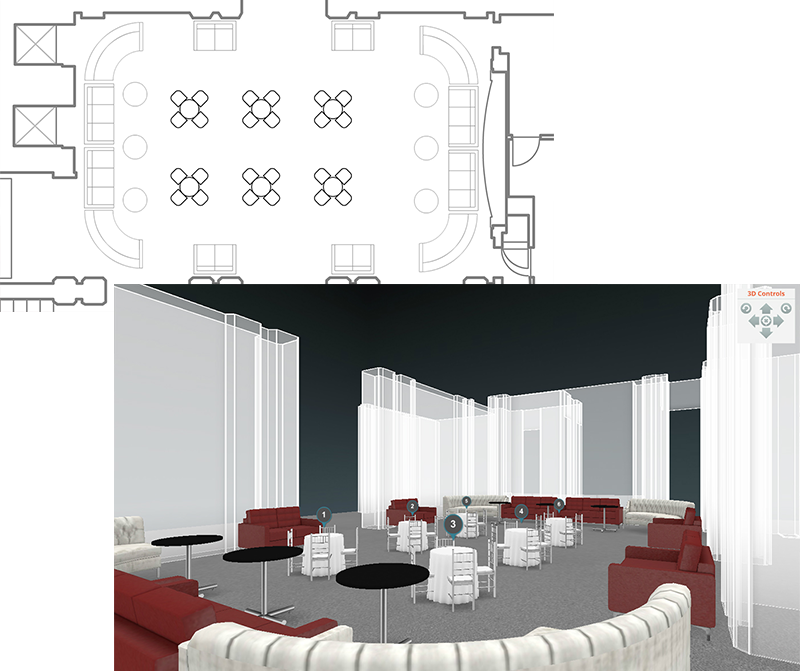 AllSeated’s 3D for floorplans offers viewing in both first person and bird’s eye view as well as AllSeated’s Virtual Reality, to truly make it feel as if you’re actually immersed in the hotel’s event space. And as part of any floorplan that you utilize and share, don’t forget to include everything else organizers or planners need to know within the layout – like rigging points, electric connections, locations of pillars, and load-in and out areas. As the old adage goes, a picture is worth a thousand words. And it’s just as important for hotels to use eye-catching images in their marketing and sales materials. Visuals showing different layouts, configurations and combinations of rooms create excitement and interest. While smartphones pictures are sufficient for casual sharing, high-quality professional photos should take front and center in marketing and sales collateral. The right lighting, perspective and staging takes a space from ho-hum to stunning and goes a long way in creating a positive first impression. One more tip when it comes to using eye-catching images. Go beyond empty rooms. Visuals with event attendees experiencing and enjoying your hotel add an emotional layer and create a sense of FOMO (fear of missing out). Did you know YouTube is the second largest search engine? As such, video is an important part of any marketing and sales toolkit, especially for hotels. There are a variety of psychology principles used to attract, convince and influence target audiences. One of the most popular concepts is that of social proof – the theory that people will adopt the beliefs or actions of a group of people they like or trust. Hotels can tap into this powerful psychology principle by promoting achievements like sustainability designations received or awards won in their marketing and sales efforts. One way to think of it: if a widely known expert or trusted association gives a hotel an impressive award, then this must be a trusted hotel. Another way to increase effectiveness of hotel marketing materials is to include promotions of achievements or awards won by employees. This may include average retention and tenure rates or designations earned like Certified Meeting Professional. Every hotel has a unique story – whether it’s the interesting backstory or unusual history of the hotel, a secret house recipe, or some other “unicorn” element unique to your hotel. When including details such as these in marketing and sales collateral, it becomes a great way to bring your hotel to life in a very human, relatable level – becoming more personable provides unique opportunity to stand out among other facilities. 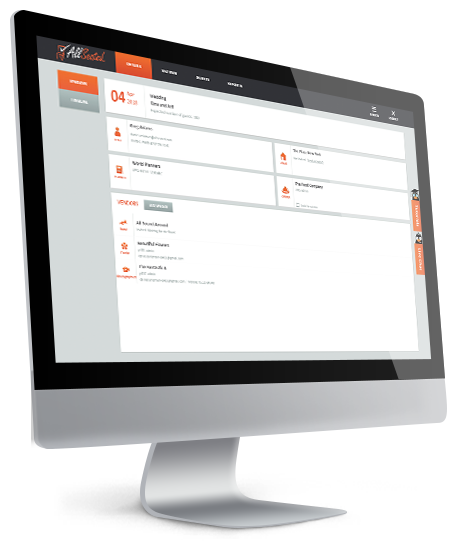 With growing competition, incorporating powerful tools in your marketing toolkit positions your hotel in the best light, paving the way for increasing sales in the process. To learn more about using AllSeated’s 3D and VR floorplans in your hotel’s marketing toolkit, contact us for more information.